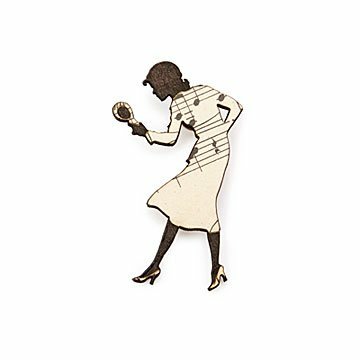 Solve your outfit mysteries with this girl detective pin made from reclaimed books. With her bloodhound and flashlight, she walked toward the swamp in search of the final murder clue. Sport this mystery-solver pin with any ensemble to add a touch of sleuthy style. Made sustainably using reclaimed books, it's perfect for literary lovers and fans of characters like Sherlock Holmes and Nancy Drew. Designed by Laura Bruland Shields and made in California. Learn more about how Laura's pins are sustainable solutions to a growing recycling problem in our interview with her on the blog. With a formidable collection of wool felt she inherited from her late grandmother, Laura Bruland Shields began her design journey. She started by toying with laser cutting and a wide range of fabrics, and ended up discovering a way to repurpose one of her favorite objects: books. Now, Laura laser cuts literary works and fuses them into one-of-a-kind pieces of jewelry. With the help of her husband, Julien, and their small team, she designs from her studio in Oakland, California. Pin is water resistant, but not waterproof. Looks just like one in ad. If they are made from recycled books then shouldn't they be different? I will definitely be ordering again. Unique pin and love how they are made. I bought this as a gift for a friend who loves mysteries. It is larger than I thought it would be (should have read the details) and I was hoping the one I got might not have music notes â€” I think using old mystery covers would be more on theme. But the quality of the pin is good. This was a gift and it was very well-received. This is definitely bigger than I expected, but clearly well made, and the perfect gift for a journalist, feminist af friend on her wedding day. < 3 Thank you! This is the perfect pin! It's a great addition to my pin collection.